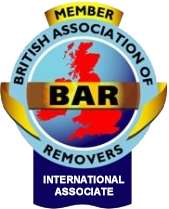 Browse through our frequently asked questions below to find out more about our removal and storage services and how we can help you when moving worldwide. If your question is not answered, please feel free to contact us and we will be more than happy to help. This is a question that can be answered more accurately at the time of our free no obligation survey, and will depend on where you are going and which method of shipment is being used. Again this depends on where you want to go and what you intend to take. There are different shipping options that can affect the cost of your move. Our surveyor will be able to offer an accurate, free, no obligation quote after viewing the effects. We can offer a quote to anywhere in the world, door to door. Can I ship a couple of boxes? Certainly. A great majority of our clients ship just a few personal items, these will be handled in one of our regular shared containers which will only have our clients personal and household effects and are not shipped together with commercial or hazardous products. Will my goods have to clear customs? Yes they will, be it either import or export. The Canary Islands do not form part of the EU regarding imports/exports and every consignment needs to go through customs. This procedure is handled by our office staff who will advise prior to shipping which personal documents are needed. You will not have to visit customs yourself - this will all be taken care of by our office staff. Which paperwork will be required for Customs clearance on imports? For the importation of personal effects to the Canary Islands, Customs require that you need to have a NIE number (Spanish registration number) and this NIE number has to be registered with Hacienda, the Spanish tax office overhere. How can we be assured of your professionalism and care with our goods? We have thousands of satisfied clients, many of whom have moved with us more than once and continue to recommend us highly. We don't rest on our laurels, however, and are constantly striving to improve and add to our services to make your move as stress-free as possible. How do you pack fragile items? Don't worry, we take care of all of this. Our experienced packers, who use specialist packing materials designed for international transportation can do all packing for export. Over the years we have developed many techniques that have enabled us to transport valuable antiques, sensitive scientific instruments and many unsusal items that other companies might struggle to transport. Cover can be obtained through our office for loss and damage whilst in transit using our UK brokers. What happens when our possessions arrive at their destination? The receiving agents are notified upon arrival. They then handle all the customs clearance procedures with the documentation we provide. With this done, you are then contacted by telephone and mail to confirm arrival and any special requirements you might have. A suitable delivery date is then arranged for you to receive your possessions. Do I have to unpack straight away? No, in fact very few people require an immediate unpack. Most clients prefer to unpack themselves in their own time. This is not a problem as we allow 30 days from the day of delivery to make an insurance claim in the unlikely event of damage.